The inventors of WordPress, Automattic, have just released an open source grammar and spell checker called After The Deadline. This new spell check and grammar correction technology is free to use and it even plugs into WordPress and TinyMCE. 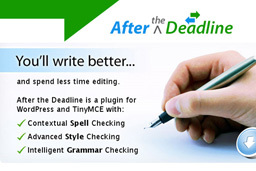 After The Deadline aims to help writers write better articles while spending less time editing them. It uses artificial intelligence and natural language processing to find your spelling mistakes, grammatical errors, poor style and misused words and then offers smart suggestions to correct your mistakes. Most of us have just been flying blind when writing our blog posts as there wasn’t a good way to check spelling and grammar. Firefox has a built in spell checker but that’s not really sufficient to edit a piece of writing. Thanks to After the Deadline we have a smart way to edit our blog posts quickly and effectively. 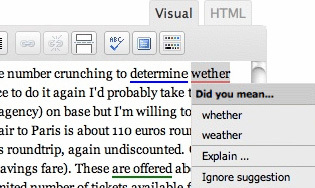 Spell Check – Checks spelling by looking at context and recommending the correct word 9/10 times. Detects Misused Words – Since this technology is contextual it is able to detect words that have been misused. We often write one word and mean another. This amazing feature is unique to After the Deadline software. Checks Grammar – The grammar checker protects writers from commonly made writing errors. It checks its huge database of phrases and rules to find common mistakes we all make. Checks Writing Style – This feature basically helps you write clearly and concisely and is based on the rules of Plain English. Error Explanations – After the Deadline will even explain the errors it detects, helping you to learn more and become a better writer. Installing After The Deadline plugin for WordPress is quick and easy. Simply download the plugin, activate it and then enter your API Key. Now you can ensure that your blog posts are grammatically correct with no spelling mistakes. Great post. Will have to try this one out! This is awesome. Especially for sites the are putting out lots of fresh content constantly. Good to have something always checking! Thanks for posting this.